Abaco – Round Two in the Bahamas! This afternoon I completed a set of adapted flies based on RH’s generous report from last time. White and pink, with small flashes of red or orange are my main ingredients and for the streamers, I used varying proportions of elk hair and/or Arctic fox fibres. Thanks in advance to RH and his March 2015 test team! I’ll keep you posted of the Outcome in due course. As always – thank you for reading and I look forward to your return. My words were “Dad – it’s never too late… Metiefly to the rescue!” So tonight I cranked out half the order and in the morning I shall complete it. My only request is that I receive an email with plenty high quality photographic evidence of their effectiveness! Prepping the JLM Special factory… metiefly to the rescue! The Spotted Grunter was my main target species when I conceived the pattern in my mind – closely followed by the Bonefish… Hopefully my fleet of flies sent to South Andros via Anchorage (honest!) will produce a bonefish or ten – there is a race on now – which species will be first? And from which Ocean? One finished – nine to go! Itu Davy’s words echo in my mind: “The fish will choose what colour works best, however it is best to start with a fly that mirrors the surrounding habitat…” As a result of his advice, there is an olive and a chestnut variant in this batch – which one gets your vote? Ready for posting – tight lines for the recipients! Thank you for reading, I look forward to your return! Pomadasys commersonnii is a much sought after prize. Many highly skilled anglers target them as one of the ultimate estuarine trophies. When I initially started researching fly patterns and fly fishing tips for catching them I was often told these fish are virtually impossible to catch on the fly. If you have read some of my posts, by now you will know how I love a fishing challenge! There are many highly accomplished fly fishermen and women who catch spotted grunter on their favourite patterns – one of whom is a staunch contributor to the amazing blog ‘Feathers & Fluoro’. I can hardly wait to present my trusty JLM Specials to these feisty fish – whatever happens next will be a dream come true! This is part two… JLM Special starting to take shape. thanks for watching, please visit again soon! This morning I had to be quick… Temperatures dropped well below zero and by the time I was finished I could not pack my rod away due to ice buildup on the line guides… It only melted when I got home. On my sixth cast a convincing take meant the trout hooked itself… After losing three fish yesterday I played the fish patiently and landed it after 12 minutes – victory! In honour of my father and the fact that today is his birthday I hereby pronounce my test fly’s official name: “JLM Special” – Happy Birthday Dad! Each fish seemed to grow bigger and fight harder… By 10h15 I had landed my third fish of the day and the final one of this Season. When I posted my fish tickets I scrawled this note: “Andy – thanks for an awesome season! Please visit my blog on metiefly http://www.itieflies.com – best regards Mark.” Because my hands were so cold I had to write by holding the pen in my fist. I wonder if he’ll be able to read it! I’ll be filming a tying video for the “JLM Special” next weekend, so lots to look forward to. Thanks for reading, please come back soon! And with it comes that wonderful sense of excitement in the pit of my stomach… Will I get the chance to unleash a few casts on Saturday? This time there’s no option of dodging gales and excusing myself over raindrops – wild horses will not hold me back! 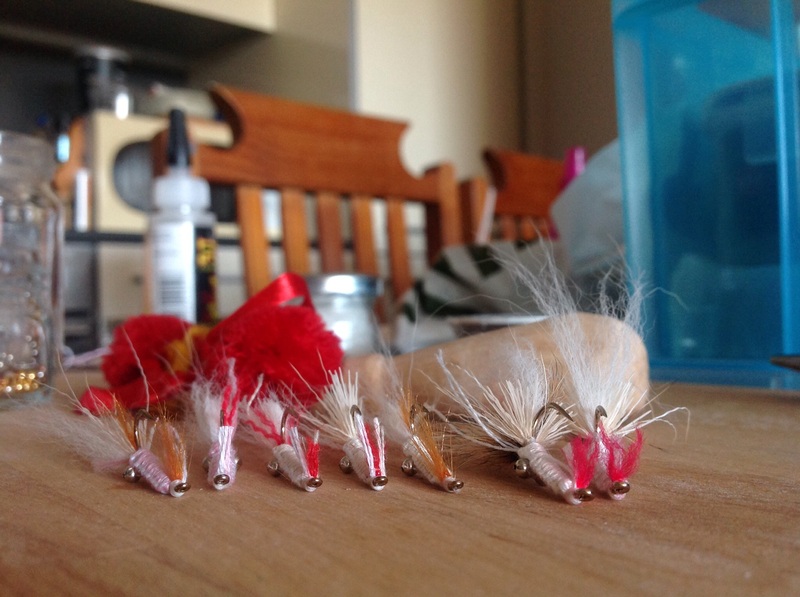 I’m planning to test out some flies that I actually designed for saltwater species (spotted grunter in SA and bonefish…) They are mud prawn or common shrimp lookalikes and there is no telling how my local rainbows will react to them. I promise to report back in due course. Does it land well on the water? Does it sink or float as required? Does it attract strikes rather than nibbles or knocks? Can you use it again after you’ve landed a lunker? The best test I’ve carried out was on a day late in March last year. To see what would happen, I committed to one fly for my whole day’s fishing no matter what… Can you guess how many fish I caught? 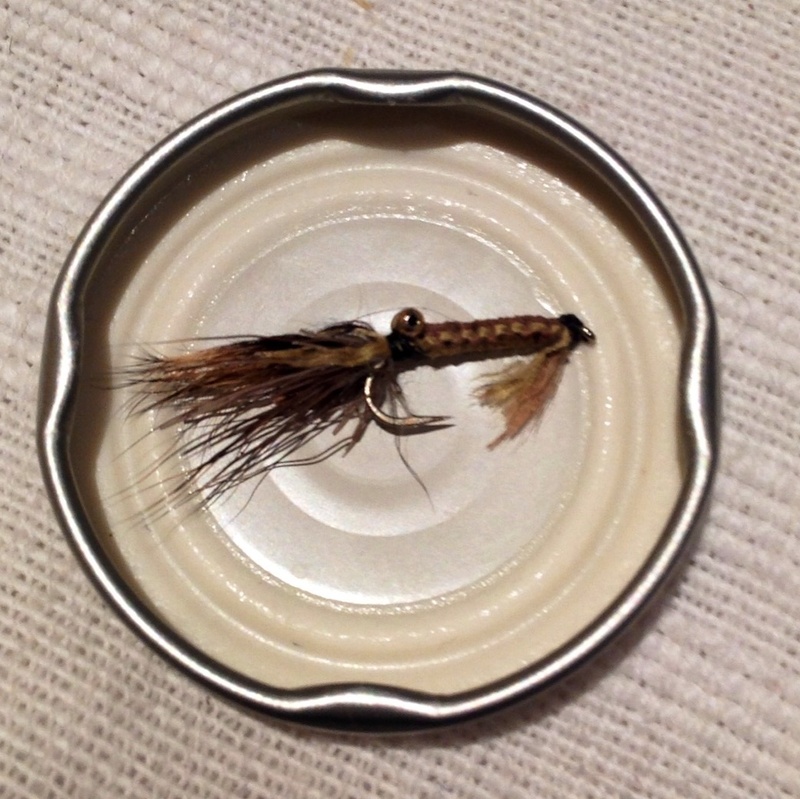 Drop me your best guess and watch this space – over the weekend I’ll give you the answer and show you what is left of my most successful fly so far! Have you got your own favourite? What’s your personal record on a single fly? I’d love to hear about it. Before I sign off, start thinking about what pattern you would like to see in my next video and let me know.